I know, this is a writing blog. So what does math have to do with writing? Well... nothing, but I do have other passions other than writing and math is one of them. So, here goes. The point? 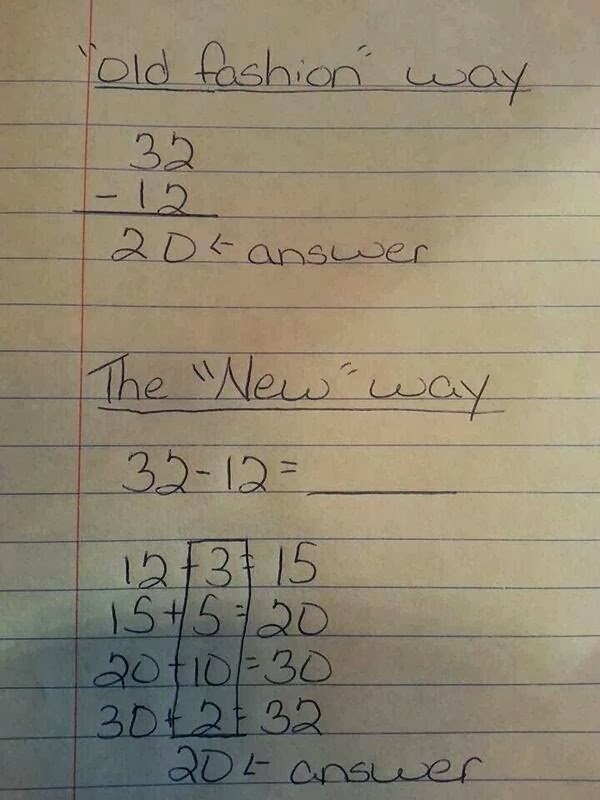 Common core math is more complicated than what I grew up with. However, I didn't feel like I was getting the full story. How as this explained to the students? I suspect if we found out, this would make more sense. I looked it over for about ten minutes and I finally understood what the method used to get that answer. I also glanced at the original post, which had over 13,000 comments, mostly about how this looks so confusing and complicated. Here's why this kid isn't getting it: It isn't about the answers, it's about the process. 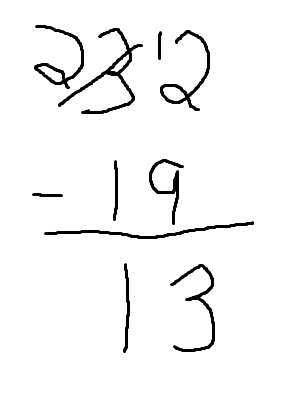 It's isn't knowing that the answer to 32 - 19 is 13, it's knowing WHY it is 13 and how to get there. "Wow, that number doesn't look like fun. However, 19 is actually 20 minus 1. So, if I do 32 - (20 - 1), I'll get the same answer. This works out to be 32 - 20 + 1. 32 - 20 is easy, it's 12, and then I add that 1 back in there, so the answer is 13." Yeah, not getting any better. 26 is 25 + 1. Now, I know that 25 times 25 is 625... I've got that memorized, but I've never memorized 25 x 26, nor do I really need to. 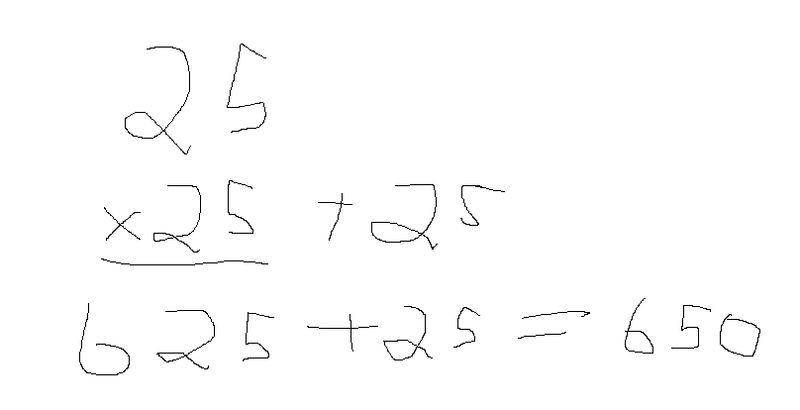 So, I square the 25 to get the 625 and then I add one more 25 (the 1 times the 25) for an easy 650. I know, I know, if you haven't memorized that 25 squared is 625, then you won't get there as fast. If you've done enough math, 25 x 25 just becomes something you remember. It just takes practice. Quick, do 12 x 13 in your head. Personally, I repeated the above (12 x 12 is 144, add one more 12, and that's 156), but this guy has another method, which he demonstrates in this video. He found a pattern, and with this pattern he is able to do it in his head. Yeah, he takes two minutes to explain it, but if you asked him what 13 x 16 was, he'll have an answer for you instantly. How about 996 x 997? Quick, do it in your head. Can't? Okay, write it out on paper like we learned in math class. Oh, wait... that's a lot of work too as you need to multiply three different numbers, add zeroes in the right places, and then add them up. Fine, reach for the calculator. Watch this video, it points out the pattern and the method so you can do it in your head as well. He taught an audience of teenagers how to calculate 996 x 997 in their heads within FOUR MINUTES. Less than two minutes later, the entire audience calculated that 103 x 103 was 10609. All in their heads. Instantly. These kids were all laughing at the simplicity of it. I've graduated from high school and college and I've never needed to figure out something with x's and y's. However, as a programmer, I've used variables like numberOfYears or quantitySold, which is really just x's and y's. The important thing was knowing how to use these variables so my programs could derive usable information. Okay, that might not apply to you. However, we all want to manage our money, right? Balancing the checkbook, finding the right investment/retirement plan, getting the best car loan, choosing the right mortgage, knowing why playing the lottery is considered a tax on people who don't know math, and more become simple when you know how all the numbers and variables work together. Sadly, when the math does get complicated, most people aren't sure what order to put the variables into a calculator for the right answer. I can't stress this enough: it's NOT about the answer, it's knowing how to get there. Let's demonstrate with somebody who recognizes these patterns. Check out this video, and prepare to be amazed. If I figured out what patterns he's using, I'm sure I could do this as well--I just have better things to do with my time. But anybody willing to figure out the methods, do the homework, and plant the patterns in their head can do it as well. Yes, math is busy work. We've all done what felt like the same math problem hundreds of times, but this effort actually builds a type of muscle memory with math. Then you can do this too. It's like Michael Jordan. He made playing basketball look easy, like all he has to do was throw the ball in the air and it would go through the hoop--most of the time. It's like he was born with it. Well, he wasn't. In high school, he was cut from his basketball team, but he didn't give up. He practiced. And practiced. And practiced. And when he got sick of practicing, he practiced some more. Arthur Benjamin makes math look easy, but I'm sure it isn't because he was born able to do complicated math. It's because he put in the practice. Once that muscle memory is put in place, when you look at 32 - 20 or 32 - 19 or 25 x 26, patterns kick in and math is done MUCH faster than grabbing a calculator, turning it on, hitting the MC and MR buttons a bunch of times (admit it, we all do it), and punching in the equation. This is why I wondered what was being taught in that first graphic. Best I can tell, this is an advanced version of counting on your fingers, but there might be something else in there. I've got a pattern to do it, but there is more than one way to kill a cat. So, my pattern might not work for some people while this might make sense to them if it is properly explained to them. I didn't want to instantly dismiss it just because it took a few lines to figure it out, my first thought was, "Why are they taking this route, and can I learn something from it?" An example I used last week: Salt Lake City airport is 300 miles away, I average 75 when I drive on the freeway, so if I need to get there by 3:30pm to pick my friend up from the airport, I better leave by 11:30am and use the restroom before I go. Another example: I got a call from a bank on Saturday offering to lower my monthly payments, but when I did the math I realized that the long-term costs far outweighed the short-term benefits. Math, and knowing how to use that math, helped me avoid a huge financial mistake. Another example from a few months ago: A cashier asked for $2.76, so I handed over $3.01 to simplify the change. What does the cashier do? She reaches for the calculator!! Now, I'm not a violent person, but I almost became one after I informed her the change was a quarter and then she looked like I was nuts and typed it in her calculator to prove me wrong. Imagine her shock when .25 turned out to be the answer. Do you like living in houses? I do!! However, they wouldn't be very livable if your builder sucked at math. When you look at everything that goes into building houses, cars, bridges, roads, and other things we take for granted in life, a ton of math was involved to make them come to fruition. I mentioned Michael Jordan above. Math is used in sports. What trajectory should MJ throw the ball, or which trajectory should he jump to maximize his slam dunk? How much force should be applied? How does this change based on his position on the basketball court? How many more points are needed to get a comfortable lead? It's all math. And music is all math. I've heard that musicians tend to pick up math easier, and I think it's because they recognize the mathematical patterns found in music and apply them to algebraic equations. Yes, the muscle memory formed in music translates to mathematics. 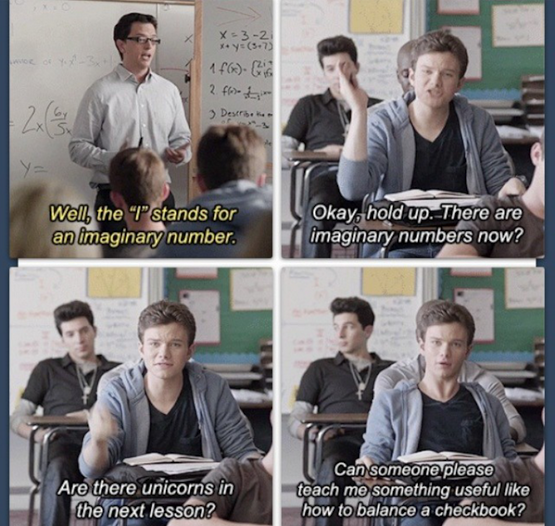 Not to mention, math is fun. Here is Arthur Benjamin again, who just made me geek out over numbers all over again.